Auto'fil Building: Key Features and Benefits. 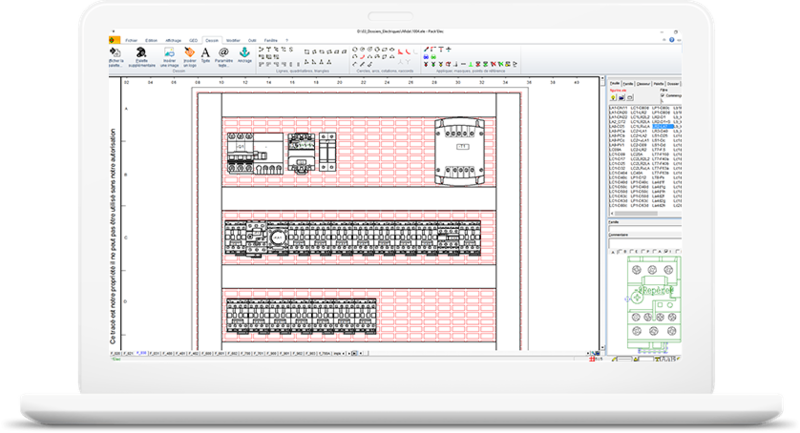 Auto'fil Building is the perfect software system generating electrical schematics from a simple table (Excel®, google sheets, Apache open Office Sheets alike). You can easily interface with other Softwares: AutoCAD , Solidworks (Dxf, Dwg), Adobe Software (PDF). By using the touch pad application on tablets. By avoiding double data entry informations and mistakes of recapture. Auto'Fil automatically calculates all the useful values in real time as the diagram is being built. For every installation considered, you can parametrise the way manufacturer(s) are selected. Dealing with existing installations almost certainly means being faced with anomalies, either because they are old installations and standards have changed, or because maintenance or extension operations were carried out with no complete calculation or checks. 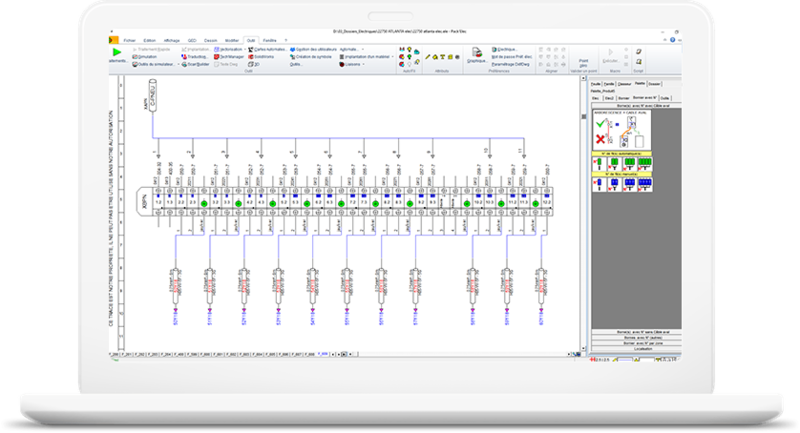 Perfectly meeting the needs of engineering offices, electrical installers and maintenance departments, AUTO’FIL allows you to save considerable time by halving the time for design compared to a standard CAD system, and adding value to time spent on studies. - Allows the design notes and layout plans to be retrieved. You also save time when making changes. It is much quicker to change the Excel sheet: new outgoing circuits are added by inserting rows. The diagram is regenerated within a few seconds and the new outgoing circuits are inserted, with the folder automatically repaginated. If you use a calculation system, then you no longer need to draw the diagrams after calculating your outgoing circuits. Interfaces allow you to automatically retrieve these design notes. This function saves you considerable time by not having to enter the data twice, and especially by avoiding errors this can cause. If you have only calculated the main outgoing circuits, you can complete the Excel sheet using the AUTO’FIL data entry functions. The folders can then be generated with a single click. 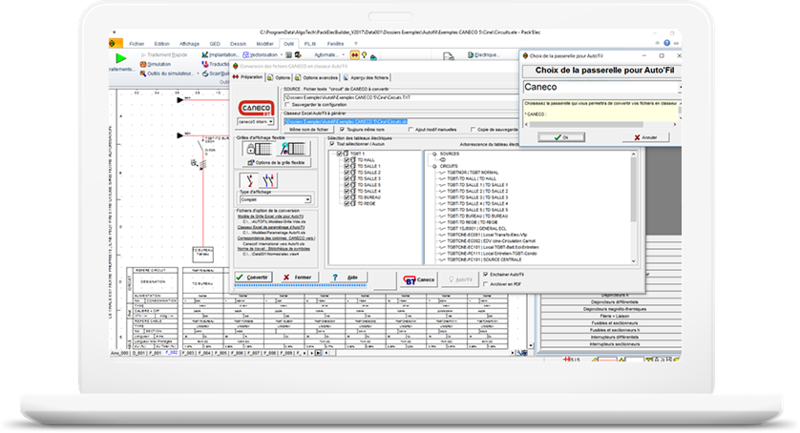 If you have calculated all your outgoing circuits, the interface allows you to automatically retrieve all the design notes in the AUTO’FIL sheet to generate the diagram, and complete it with more precise control notions. Similarly, the folder is fully modifiable after generation. An engineering office generally starts by laying out circuits in a general layout. 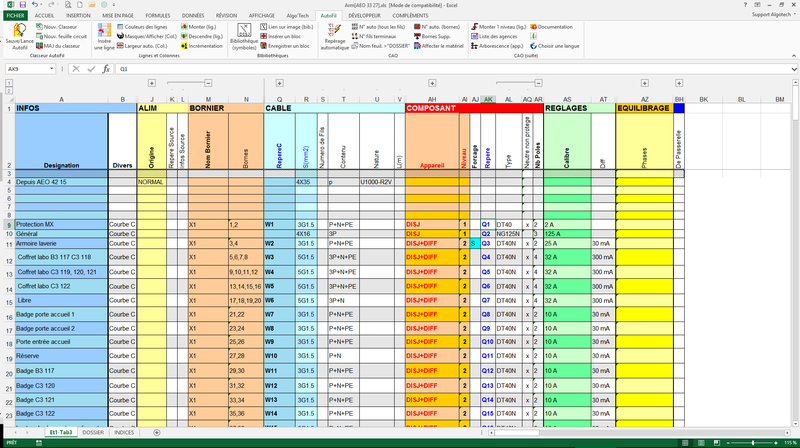 AUTO’FIL allows you to retrieve all the circuits shown on the AutoCAD or Revit general layout and automatically generate the information in the Excel sheet. Then you just need to add the missing information: general protection devices, remote control, etc. This interface also saves you considerable time, and ensures that no outgoing circuit is forgotten when you produce the diagrams. Thanks to its ability to import or export IFC files for interacting with digital models, Auto’Fil can be incorporated into your BIM processes and thus generate your diagrams from the information entered in Revit. Operators can then simplify their maintenance and operating procedures for their electrical installations. AUTO’FIL is also a very effective tool for surveys and updates to existing cabinets for maintenance departments. The simple layout of the entry sheet is perfectly suited to field surveys: they can be entered directly on a laptop or tablet. 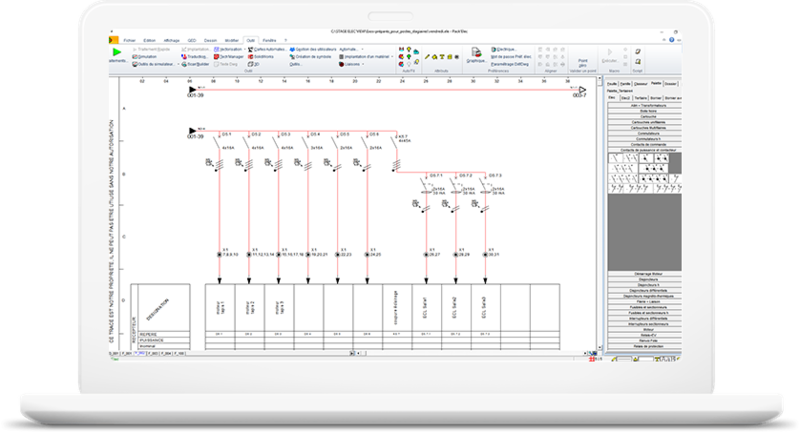 The electrical diagram generated with Auto’Fil automatically contains the folio numbers, summary and folio indexes. The general information entered in AUTO’FIL (titles, date, etc) is in the title blocks. from symbols associated with equipment references selected in the parts list.